Housed in a tiny SMD package, the ES Series utilizes an advanced FM / FSK-based synthesized architecture to provide superior performance and noise immunity when compared to AM / OOK solutions. An outstanding 56kbps maximum data rate and wide-range analog capability make the ES Series equally at home with digital data or analog sources, such as audio. A host of useful features including RSSI, PDN, audio reference, level adjust, low-voltage detect, and a microprocessor clock source are provided. 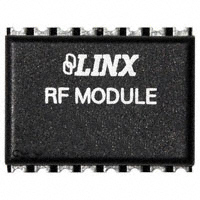 As with all Linx modules, the ES Series requires no tuning or external RF components (except an antenna).